Emily Pugh flew to New Zealand to learn about rocks, and got an up close experience on Mount Ngauruhoe slipping and sliding down through past eruption remains. The Indiana State University senior from Cory journeyed to the island country for geology field camp, which included examining and mapping different features such as rock features along a coastline and the effects of a retreating glacier. It also included an excursion to Mount Ngauruhoe - the active volcano that stood in for the fictional Mount Doom in the "Lord of the Rings" movie trilogy. Pugh, along with two others, spent two hours climbing the 45-degree slope covered in loose, prickly volcanic rock. The Indiana State cross-country runner equated the climb to running two 10-kilometer races back to back. "It was amazing, beautiful and scary," she said of the climb, especially the slipping and sliding down the mountain through the loose rock. "It was dangerous." 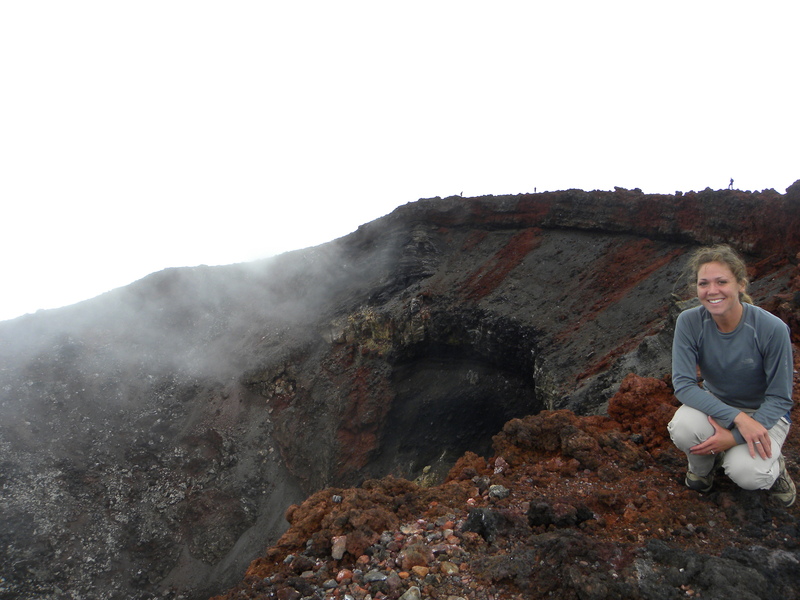 Pugh stood at the lip of the volcano, which last erupted in 1977, and peered down into its steaming vent. "The vent is hands down the most breathtaking yet daunting view I have ever seen," she wrote in an email describing her climb. "Shades of red and black and gray rock that open up a huge vent that is very deep - I could not grasp its depth. "It was overwhelming the excitement I had standing at the mouth of this magma-shooting, lava-spitting monster." Geology majors at Indiana State must complete a field camp experience as part of their graduation requirements. "Field camp is really the culminating experience for our geology majors," Jennifer Latimer, assistant professor of geology. "They take things they learned in core courses in geology and put them to use in the field." Most of Indiana State's geology majors travel to Wyoming and Colorado where they can see igneous and metamorphic rocks - which differ from Indiana's limestone, silt stone and shale - as well as plate tectonics' effects on the earth with volcanoes. "There's a complex relationship in the rocks they have to identify and come up with a history of how it got there," Latimer said. Field camp allows Indiana State students to put their knowledge to work outside of classrooms and laboratories by testing in a real environment. "You've got to get out there and see what geology is all about rather than just read the book," Pugh said. "Really I feel like I learn the best when I'm outside. It sticks with you a lot more." Pugh finished her class requirements in the fall and didn't want until summer when camps would be offered in the United States. Instead, she found a field camp in New Zealand for this spring. "I've always heard that New Zealand was a paradise," she said. "It really worked out that I got to have New Zealand as my classroom." In that classroom, she hiked along a coastline examining exposed rocks, noting their different features and determining their types. Then she plotted them on aerial maps of the area. She climbed Mount Roberts to look down in the valley below to identify the features left behind by a glacier as it retreated. She also traveled to the Fox and Franz Josef glaciers. "I studied a lot of granite rock too," she said. Lava creates granite as it solidifies. By studying the rocks, Pugh said she learned about different stress the rock underwent or about the flow of the lava. "When you see the different minerals in granite it tells you about the lava chamber," she said. That sort of hands-on experience also created a shift in Pugh's perception of herself. 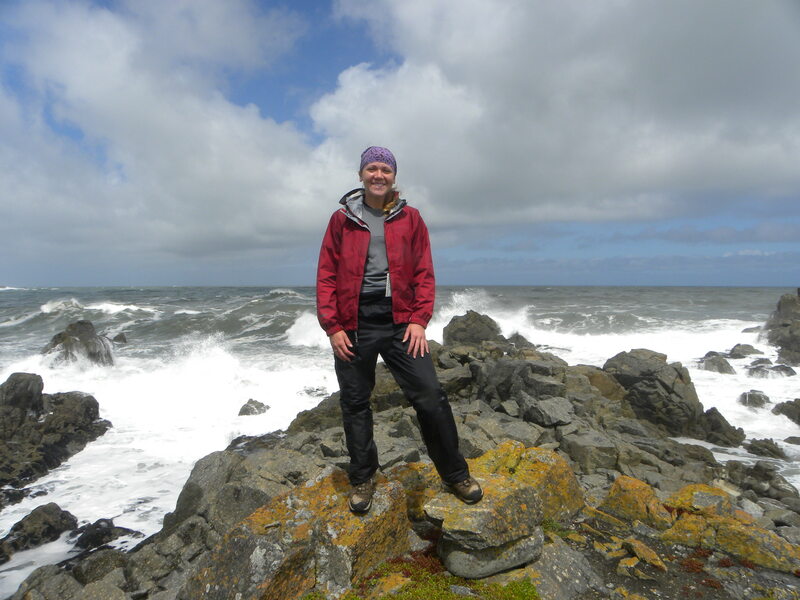 "I feel like I'm more of a real geologist," she said about her experience's impact. "It's so different when you're listening to a lecture and seeing beautiful pictures then when you're outside and you have to figure out why it's here and what it means." The experience also illustrated the importance of books as well. "There's also what I didn't remember and ‘oh yeah, I need to go back to my books and study,'" she said. "The experience is really priceless because you learn a lot." Now, the McNair Scholar is preparing to visit schools where she's been accepted for graduate school. She plans to study either paleoceanography or paleoclimatology. "The ocean to me just seems so ancient and mysterious. People and things have come and gone and the waves keep breaking on the shore," she said. Her goal is to work for the U.S. Geological Survey as a research scientist investigating global warming. "I want to learn about past environments and so see what we could have in the future and ways that we could mitigate global warming," she said. Cutline: Emily Pugh, senior from Cory, witnesses the Fox Glacier in New Zealand during geology field camp. Courtesy photo. 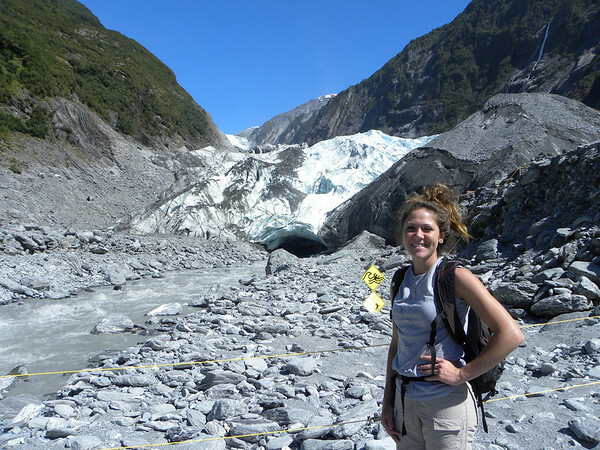 Emily Pugh journeyed to New Zealand for her geology field camp experience.